The way we move has a significant health impact. Currently it's mostly negative, but it could play a positive role. Active transport, walking and cycling, is the way to go: it will keep people active sustainably, because it becomes part of everyday life. The environments in which we live mostly hinder active transport, but this could change if the health sector played a leading role and worked together with other agencies as well as local government. NSW Health needs to get much more involved in fostering active transport. This article outlines a study on transport as a determinant of health, with a focus for the potential role for the health sector, authored by Robert Catford, CAMWEST Secretary. Transport as a Determinant of Health (PDF, 188Kb). Transport, a significant activity in our everyday lives, is a major determinant of health both directly and indirectly and thus deserves significant attention from the health sector. Solitary private motor vehicle use continues to increase its proportion of journeys undertaken and the amount of vehicle kilometres traveled. Current transport and land use planning foster habitual car use. Health damaging influences of transport include: traffic injuries; air pollution; noise pollution and vibration; stress and anxiety; loss of land and planning blight; and severance of communities by roads. Transport can be health promoting especially if car dependence is avoided and greater opportunity is made of active transport, the use of public transport, cycling and walking. Active Transport, a health term, is defined as physical activity undertaken as a means of transport and not purely as a form of recreation. Australia is highly car dependent despite being one of the most urbanised populations in the world. Australia has the second highest car ownership rates in the world, 0.47 cars per person. The Commonwealth government supports car dependence in a number of its policies (Roads to National Importance program, Roads to Recovery program, fringe benefits tax incentives, etc). The total costs of roads to the community outweigh the fees collected through fuel taxes, insurance premiums and registration fees by $19 billion. Pollution: Levels of noise and air pollution from transport continue to be at levels injurious to health. Despite improvements in technology to late model vehicles and the use of cleaner fuels, Sydney's air pollution continues to deteriorate due to the increased volume of traffic. It's estimated that air pollution kills 1000 Australians per year. Injury and Fatalities:Each fatal road crash is estimated to cost $2 million6, leading to a total of $15 billion p.a. cost to the community. Pedestrian death rates make up 18% and cyclists 3% of all road fatalities which is unacceptably high and significantly disproportionate to their mode share of travel. Social Health: Transport impacts on the social health of the population. This can lead to increased social isolation, loss of spontaneous exchange, community severance, decreased perception of safety, higher crime rates and greater social inequity. Greater car dependence tends to lead to a reduction in the number of local shops especially in poor areas and particularly affects less mobile people. In addition to reduce the negative health impacts of transport, active transport modes are health-enhancing as they require a higher degree of physical activity. In 1998 Sydney residents owned around 1.2m bicycles including 39% of all households. However, only 1% of the Sydney population cycles each day. The average distance for most urban car trips in Australia are short enough to make cycling a feasible alternative. It may also be no surprise that Holland doesn't have a childhood obesity problem. Healthier forms of transport are more equitable than private motor vehicle transport as they are available to all members of the community. 37% of Australians don't have a driver's licence. Active transport provides opportunity to undertake physical activity within daily routines and busy schedules. Sports Medicine Australia, 2002 stated that diseases of inactivity are now the biggest killer of women and second only to smoking for men in Australia. Activity levels of children can affect their academic performance, concentration, behaviour, stress levels, and self-image as well as preparing a child for later life. Independent travel via walking or cycling can help to develop confidence and independent learning. Walking buses and a few cycling buses, encourage walking and overcome the safety concerns of parents. There is a now a shift to encourage moderate physical activity built in to daily routines rather than vigorous episodes added to life. Because there are many more daily opportunities to engage in moderate activity than in vigorous activity, it is now necessary to consider a much wider range of policies and settings. Active Transport rests on the premise that incidental physical activity embedded into daily life has the potential to be sustained. Active transport will keep people active because it becomes part of life. One in 5 Australian adults is obese, 67% of males are either overweight or obese and 52 % for females. Over 5% of children are obese and 14-18% are overweight. Obese children have a 25-50% chance of progressing to adult obesity. Obesity increases risk factors for developing heart disease and type 2 diabetes. Physical inactivity is a major factor influencing the rise in obesity and overweight. Cycling and brisk walking are realistic means whereby the great majority of the population can keep fit. Both are forms of aerobic exercise which minimise the risk of muscle or ligament injury, and represent straightforward, cheap and much more widely available means of maintaining good health than sports. Walking is the main option for increasing physical activity in sedentary populations as it is the most utilised mode of physical activity for the majority of the population. Cycling enables a far greater geographical area to be accessed than walking. In Sydney, the average length of car trips is 9.4km. Short distances such as these are very conducive to cycling. In fact motorists commuting to work in Sydney travel at an average speed of 17.62 km/hr. A cyclist can average up to 30km/hr. The health sector in Australia has begun to make some attempts to integrate transport issues into the domain of health. However, Australia has been slow to follow the lead of other developed countries in encouraging active transport as a key solution for overcoming sedentary behaviour and in reducing other health problems directly related to transport. Key areas to focus on are: schools; universities; workplaces; shopping areas; health services; government (both commonwealth and state); local government; transport; and the media. The Health Sector needs to work co-operatively with other sectors in this area. The growth of Parramatta central business district provides an opportunity to plan for increased reliance on healthy forms of transport. A whole of government approach to intersectoral collaboration is about to take place called the Parramatta Patronage Trial that is designed to increase the use of public transport by commuters. Parramatta Council will be involved in the Parramatta Patronage trial and are actively involved in the encouragement of public transport, cycling and walking. 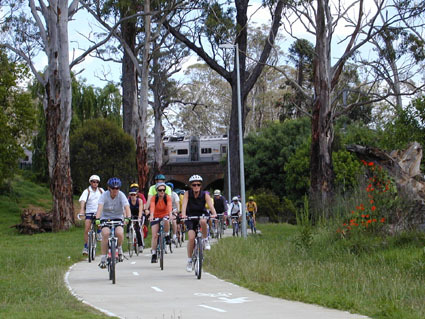 Parramatta council has increased its funding of walking and cycling infrastructure and developed the Parramatta Cycling Guide. The Parramatta City Council Bike Plan has set a target for cycling to make up 5% of all work trips to Parramatta central business district by 2021. NSW Health should recognise that it has a role to play in assessing the health impacts of transport policies, practices and projects. It should explore developments in Australia and overseas for the use of Health Impact Assessments for assessing the health-damaging and health-promoting impacts of transport policies, practices and projects. The health sector should look for opportunities to work collaboratively within the health sector and with other sectors in the area of healthy transport: possibilities exist already such as physical activity workgroups, involvement in projects like the Parramatta patronage trial, helping to develop safer routes to school for children walking and cycling. The health sector should attend to healthier transport policies within its own services and through that learn more about influencing the policies of local government. 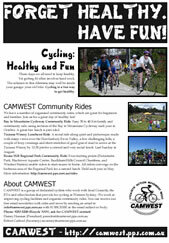 For example, Westmead is a key health service area, and should offer a much better cycling and pedestrian environment. Place more emphasis on prevention and public health measures that recognise the environmental determinants of health and a reduction in the attention given to treatment and individual determinants of health. 5. Ensure health sector input into the municipal planning instruments of councils that impact on health eg. Council's Management Plans, Social Plan, Local Environment Plan, Development Control Plan, and the State of the Environment report. Advocate for councils to have public health plans as exist in Victoria. See this program organised by the Queensland University of Technology which seems to have a few schools in Brisbane involved. We have heard people cite legal issues as an obstacle for the 'Walking Bus' idea, yet it seems to be alive and well in Queensland. Why not follow their example here? In America, fat and poor go together. This book looks at why. Read a review by Salon or see the book details on Amazon. A poster encouraging people to see cycling as a fun way to get healthy. It's ideal to put up on your local medical centre.